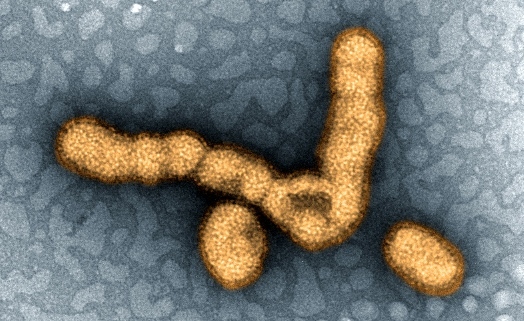 HHMI researchers tried to identify the cause of the girl’s severe response to influenza infection. Rare genetic mutations that prevent infected cells from boosting the production of antiviral molecules known as interferons are responsible for a life-threatening case of flu in an otherwise healthy two-year-old girl, researchers have found. The discovery provides the first explanation for why some children become seriously ill when they encounter the flu virus for the first time. Casanova and a team of international collaborators reported their findings March 26, 2015, in Science Express. The child in their study has fully recovered. With an annual flu vaccine, she has been able to fight off subsequent influenza infections at seven years of age. Understanding the specific immune defect that permitted her infection to develop into severe illness suggests new strategies for treating such cases in the future, Casanova says, pointing out that recombinant interferon is commercially available. Casanova says a fundamental problem in the field of infectious disease is explaining why for most pathogens, only a small percentage of infected individuals develop clinical disease, particularly during a first-time infection. His labs at Rockefeller and the Necker Hospital for Sick Children in France are dedicated to uncovering genetic factors that make specific types of infections more threatening for some people. In the last two decades, his team has identified genetic mutations that make people vulnerable to a variety of infectious diseases, including tuberculosis, mucocutaneous candidiasis, and herpes simplex virus encephalitis. Now his team is focusing its attention on genetic causes of severe influenza in childhood. Casanova and collaborators in hospitals around the world are seeking to identify infants, children, and young adults who become critically ill during a first-time influenza infection, and track down the causes of their severe response. Their new findings come from a a two-year-old girl who was admitted to a pediatric intensive care unit in France. She had not previously experienced severe viral infections, and blood tests indicated this was her first influenza infection. The patient was treated and recovered, and Casanova’s team began their search for the cause of her illness. Their first step was to sequence all the protein-coding DNA in her genome. They found two mutations that affected the gene for IRF7, a protein that switches on target genes to amplify the production of antiviral molecules called interferons. “In any cell in the body, when a virus infects the cell, IRF7 is going to be activated and is going to drive the amplification of interferons,” Casanova explains. In laboratory experiments, the team confirmed that the patient’s blood cells failed to produce interferons in response to infection with a number of viruses, including influenza virus. Other antiviral genes were activated as expected. The scientists also investigated how the defect in IRF7 affected other types of cells. They used dermal cells from the patient to derive stem cells and then pulmonary epithelial cells. Pulmonary epithelial cells line the inside of the lungs and are targeted by the influenza virus during respiratory infection. The team found that influenza virus grew better inside the patient’s cells without triggering the production of antiviral interferons. More than four years after her stay in the ICU, the patient is healthy. “She couldn’t control the primary infection by influenza virus, but she responds to the annual influenza vaccines and now she is doing very well,” Casanova says. What Casanova’s team learned by studying her cells could benefit other patients, as well. “Had we known the patient had IRF7 deficiency when she was admitted, perhaps she would have benefited from recombinant alpha interferon, in addition to the Tamiflu and oxygen that she was given,” Casanova says. His team will continue to investigate genetic causes of life-threatening influenza in additional patients, but it is reasonable to expect that defects in IRF7 or related genes may contribute to other such cases. For that reason, Casanova says clinicians should perhaps consider including interferon alpha in the treatment of severe unexplained flu.